Bugaloo shoes is having a grand sale - $12.99 (US) for any pair of shoes in their online store! 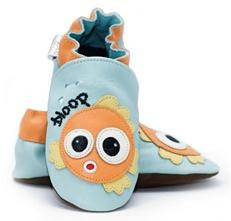 Bugaloo Kids makes soft soled shoes for babies and toddlers up to 24 months old. I was so happy when I discovered these shoes, since my baby, when he was about 12 months, had chubby, thick feet (from sole to the top of his foot!) that wouldn't fit into any other shoes I had tried. Bugaloo shoes are made with leather, and are elasticized at the back ankles. The soft soles are stain resistant, and you can wash the shoes in cold water with mild detergent to keep them looking new for longer. Best of all, these shoes are easy on your budget! Regular price for a pair of Bugaloo shoes is just $19.99 (US). So get try out a pair now during the sale! Lots of cute styles to choose from! Shipping is easy on the budget, too - $3.99 for two pairs! Shop this deal at www.BugalooKids.com. 0 Response to "$13 Soft Soled Shoes at Bugaloo Kids"